Yes, until she's moved to Wreck of the Icerunner during Lights Out! 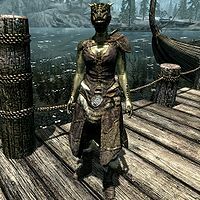 Deeja is an Argonian assassin and the sister of Jaree-Ra. Prior to Lights Out!, she can be found at the docks of Solitude. Until Lights Out! has been started, Deeja will wander around the dock area all day, and may be found aboard the Red Wave at night. She is extremely rude to you and she will frequently respond to your attempts at conversation with remarks such as "You, talk to egg-brothers. Deeja has no words for you." and that "You have no knowledge of who you speak to. Go away." She may also brush you aside with "You want knives? You want them in your belly? No? Then you stop talking to Deeja." or "Shoo! Go away! You get nothing from me." Finally, she may also threaten you by saying that "You bother me again, maybe you will not walk away. Understand?" During Lights Out!, you will encounter Deeja at the Wreck of the Icerunner, then have to kill her shortly after talking with her. Before becoming hostile, she will initiate conversation by greeting you with "My brother told me you were coming. I'm supposed to give you what you've earned." You may then ask for your share of the loot but she will instead become hostile and say "Ha! I'm afraid the loot's already been moved. You've been useful to the Blackbloods, though. You've earned a quick death." Deeja wears a set of hide armor and a pair of hide boots. She wields a leveled dagger (up to Daedric quality) in combat, and carries lower-class loot and gold, as well as a spare belted tunic. Lights Out! : Help run a cargo ship aground. This page was last modified on 19 April 2014, at 16:39.